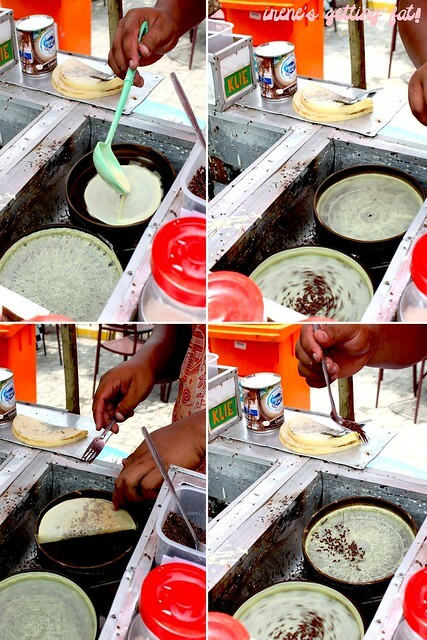 Indonesian's style of crepe, if I may. Or wafer. I'll let you decide after reading this post. 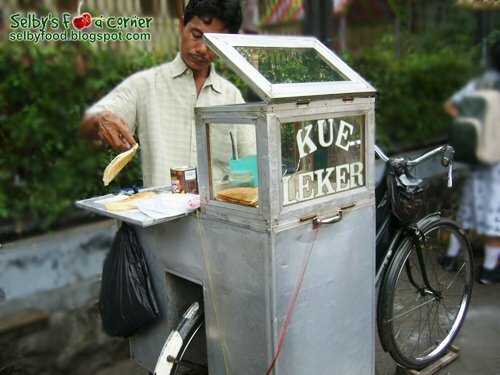 Kue lekker is a wafer-thin, crispy snack, usually sold by street carts. 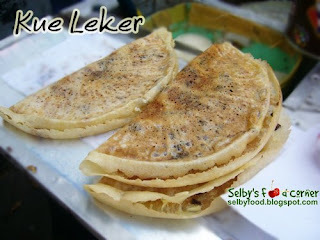 It's not that different with crepe or wafer, as it has similar ingredients to make. 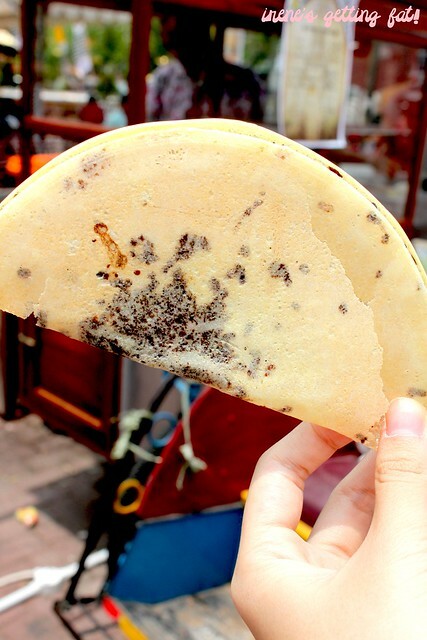 However, while crepe is usually served wet and soft, this one can make a mouthwatering crunch sound when bitten. 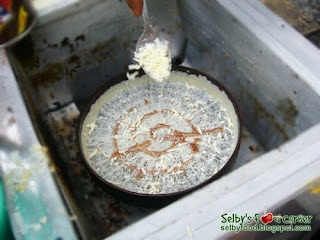 The filling is various and sometimes it goes with the seller/vendor's or customer's imagination. The usual ones have sugar, chocolate, cheese, sugar, and/or condensed milk, but nowadays you can even ask for sliced banana, syrup, peanuts, and many more. It's made with a small, flat pan which will be rotated quickly by the vendor to speed up the cooking process and making it crispy. He will use an attached handle to rotate the pan, some may use pedals to do so. When it's cooked, it'll be folded to semi-lunar shape and then it's ready to be served. It is said to be originated from Solo, East Java. The name 'kue lekker' is a mix of Indonesian and Dutch languages, as 'kue' means cake in Indonesian, and 'lekker' means delicious or great in Dutch. So crispy, sweet from the filling (a bit salty sometimes if you add cheese), and very much addictive. 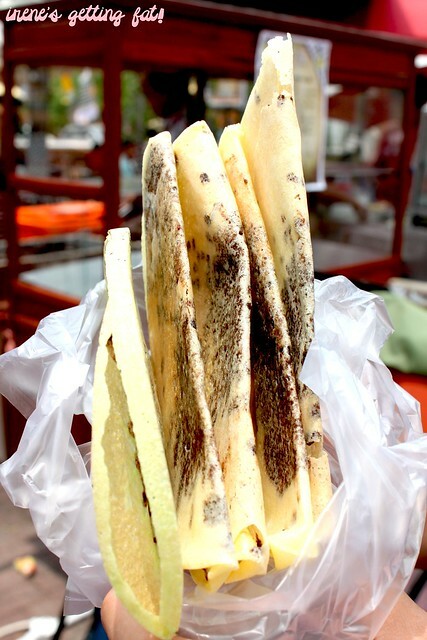 It's one of my favourite after-school snack, and I used to buy like 10 of it after finishing my classes. My favourite would be the ultimate; chocolate, cheese, and banana. I think it's getting rarer these days, which is a shame. Like I said, it's usually sold from street carts with the words 'kue lekker' on. I think it's pretty much the same as making crepe, but you have to make it very thin and let it stay on the pan for longer amount of time to make it crispy. I found a good one, though, from Umiabie, translated. 2. Mix the eggs and add it to the flour. Then add vanilli, salt, and water. 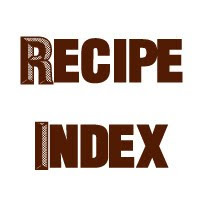 Mix until there is no lump. 3. Let it rest for about 20 mins. 4. Prepare the flat pan and heat it, smear some butter/margarine. 5. Spoon some of the batter and put it on the pan, shape it to thin circle. 6. Let it dry on the pan so it'll become crispy. 7. Add your filling and fold it half, flip it to the other side to ensure thorough cooking. Now I'm craving for some. Should I make some now?